Enid Blyton’s Magic Faraway Tree Books Adapted for the Big Screen! An incredible six decades since their first publication, Enid Blyton’s Magic Faraway Tree books are being adapted for the big screen — in a bid to bring the much-loved author’s stories to modern young movie-goers (and readers). The Faraway Tree series, which tells of the adventures of three children who stumble upon an enormous spellbound tree in an enchanted forest, has been optioned for a live action film by director Sam Mendes’s production company. The Enchanted Wood, The Magic Faraway Tree, The Folk of Faraway Tree and Up the Faraway tree were penned between 1939 and 1951, yet there’s a distinctive enthralment in reading the tales that remains to this day (in spite of – or perhaps even partly because of – such charmingly dated patois and sensibilities) — and who could ever forget such eternally fantastical characters as Moon-Face, Silky the Saucepan Man, and yes, even Mister Watzisname? The project will no doubt pay loyal homage to the captivating spirit of the books, and the adaptation is in inarguably capable hands; Neal Street Productions’ previous films include the Oscar-nominated Revolutionary Road as well as the recent stage adaptation of Charlie and the Chocolate Factory. 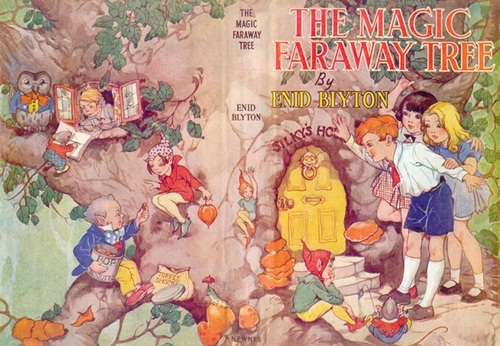 The deal for the film adaptation was signed with publishers Hachette, who acquired the Enid Blyton estate, made up of over 800 novels and short stories, in 2012. The Faraway Tree film is just one part of many in a long-term vision by Hachette to “catapult Enid Blyton into contemporary society”, including cultural treasures The Famous Five books undergoing a “language update” in 2011, to make them more relatable for a new generation of readers — notwithstanding the fact that Blyton, who died in 1968, is still one of the biggest selling children’s authors of all time, with her written works having sold more than 500 million copies worldwide in 40 languages. Explore the REAL World with Elmer’s Photo Patchwork AppHow to Make a Candy-Free (FUN) Gingerbread House!